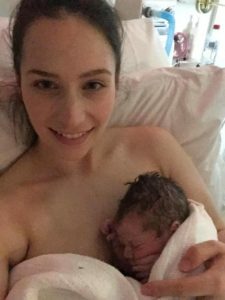 Rachael’s 2nd Awesome Hypnobirth Story! Monday 30th of October my started surges at work, nothing too full on but there was one that made me stop and breathe, I actually said to a work colleague that I didn’t think baby would wait much longer. That night they picked up to about 10 mins apart & lasting 40-50 seconds. They eased off after around 2am & were very random on the Tuesday, sometimes coming at 10 mins apart for an hour & other times not coming for an hour at a time. The night of the 31st things picked up and they were back to 10 mins apart, at 10 I decided to try and get some sleep but they kept waking me up ever time I had one meaning I was only getting 8ish minutes of sleep in between. At midnight I officially hit 37 weeks & would be allowed to birth at our local hospital, almost as if I gave my body permission I felt them get more intense and found it more comfortable to be on all fours during a surge but then lay back down and snooze while I waited for the next one. They jumped back and forth from 5 mins apart – 10 mins apart but the actual feeling of the surge felt the same, I was sure that they would fade out into nothing. After about 2-3am I found it too difficult to sleep so I spent some time on my birthing ball at the side of my bed, I was getting up to the bathroom ever half hour or so and was starting to feel things becoming more powerful but I’d decided that the easiest thing to do was wait until 6:30 when daycare opened so we could drop off our toddler and then if I felt like it was serious enough we could go to hospital. I got back into bed and tried to force myself to sleep to make it to 6:30am. I was back to my cat nap, surge on all fours routine until almost exactly 6:30 when my daughter woke and I woke my husband up and asked him to get her up and off to daycare (he had been asleep this whole time). I don’t think he realised how powerful the surges were until he got back from dropping off our daughter & I asked him to apply counter pressure to my back while I hummed through surges, they were now anywhere from 3-8 mins apart but quite intense. I decided things were probably serious enough to warrant a call to my dr so we spoke to her at around 8:30am and filled her in, she said she’d be at the hospital for the day so just to keep in touch. After speaking with our dr I think I was struggling to understand it was actually time for baby to come because I asked my husband to put our things in the car ready to go but once he had done that I suggested we put on a movie and try to forget about the surges – HA!! By 9:00 I decided we should probably head down to the hospital as my water hadn’t broken yet and I was concerned that once it broke baby would be here without time to spare. We had a lovely calm drive to hospital talking about how crazy it was that maybe the next time we drove this road together we might be a family of four (still not convinced it was the real thing) & then I mentioned that I was worried everything would stop when we got into the hospital environment, especially considering it was daylight and I’m far more comfortable at night. The 15 min drive to the hospital took us 30mins because we sat in the car and sent some txt messages & checked Facebook before going in 😂. I had several surges walking into the hospital, a nurse even asked me if I needed a wheelchair, I finished my breathing and said with a smile, no thanks, I’m okay! This was about a minute after the video I’ve uploaded. We caught up with our midwife & dr, our dr took car of some paperwork while our midwife showed us to the birthing suit. After the paperwork was finished my dr gave me the option to be checked or not, completely up to me. I decided I would like to know how things were going, by the time we got around to actually checking me it was 10am & I was 8cms with waters bulging. My dr laughed, shook her head and said she won’t be going too far! I laughed and said that’s why I came in because I thought as soon as my water goes the baby will be here. I took advantage of some gas and air through transition to avoid any kind of panic, which worked perfectly because within a couple of surges I was through the transition and uncontrollably pushing. After a few big pushes my waters broke in a spectacular fashion, making it clear why my dr and midwife were sitting off to the side! After my waters broke it was such a relief of pressure, then I could concentrate on getting baby here. I was instinctively feeling for my baby while pushing, without even knowing I was doing it I guided babies head out with my own hands had a break between pushing and then pushed the rest of baby out into my hands and brought HER up onto my own chest! I had birthed my own daughter without the midwife or dr so much as touching her…. I don’t think there is anything in the world more powerful than that experience. Hypnobirthing is absolutely incredible!!!!!! !